Whether it is out of a need for an outside perspective or simple curiosity, the idea of exploring yourself and the world around you through the supernatural and spiritual seems to truly be resonating with a growing number of people. Enough so that you yourself may have once or twice searched for things like “physic reading near me” (sic) or “palm reading places near me”. For those who are new to the higher realms and spiritual intuitions, it can all be a bit overwhelming. Psychics, palm readers and other mystics can help to analyze our conflicts and guide us through some of the more trying and emotionally difficult times of our lives. They can be our source of grounding and focus among the chaos. Even if you are familiar with practices such as psychic readings, palm readings, and other spiritually connective rituals, it’s always good to brush up on what to expect from someone new just in case you are in need of some immediate guidance when you or your psychic are out of town. Here are a few things I like to keep in mind when I am looking for a physic reading near me (sic) or before I go looking for palm reading places near me. If you are new to all of this, it is hard to know what to expect. Which also means that it is easy to get scammed. Of course it is important to be open to new experiences. When I am out of town and searching for palm reading places near me or trying to find a physic reading near me (sic) in the area, I do my best to go into the situation with an open heart and mind. That being said, I also have to pay attention for people who would hope to exploit those qualities. Here are two things that are clear indications that you need to terminate your session and move on to someone who is qualified.-Curses: If your spiritual guide reveals that you have a curse or a hex on yourself or your loved ones, then asks you to pay to have it removed, that is a pretty sure sign of a spiritual hack who is just after your money. It is important to keep in mind that your relationship to your spiritual guide is a personal, and usually an on-going one. It takes time and effort to build and establish trust and connection. A quick fix for cash is a serious warning sign. -Certain Predictions: Your psychic, reader or analyst should not be giving you lottery number, warning you of your death or foretelling of serious tragedy. Psychics are guides who provide insight, they aren’t human magic 8 balls. Always keep in mind that there is a reason you are searching for answers outside of yourself. There is a good chance that you have already tried to find a solution or answer on your own before you even considering typing “physic reading near me” (sic) or “palm reading places near me” into your phone. If your gifts and perspectives could have helped to provide you with whatever it is you are looking for, or shed light on the issues of your life, they likely would have done so by now. Sometimes we are just too close to something to see it as it truly is. There is no shame in seeking outside assistance to gain clarity. 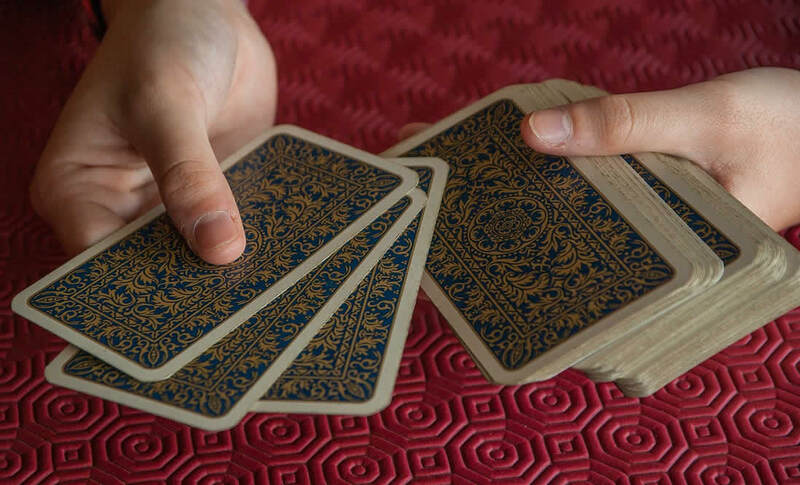 When you are having your tarot cards read, palms read, tea leaves read, or any other kind of mystical reading or analysis, it is extremely important that you let your reader take the lead. Their energy and unique abilities allow them to connect to the universe and higher spiritual realms. Their process will help them to provide the answers and guidance you are in search of. Your new reader may not do things exactly the way you anticipated them to, or they may have a flow or style that is different than what you are use to. Trusting someone new can be a real challenge, particularly when it comes to personal matters. It can be hard to open up and form a connection to someone, to let them harness your energy and give insights into your life. Releasing this ultimate control during your reading is the only way to access the energies, deities, and spiritual channels necessary for your reading to be meaningful and successful. There are some situations, such as job promotions and romance, where the outcome is a mystery but you know what you want the answer to be. Going into a reading with your fingers crossed that your reader will give you the specific answer you want is not a healthy way to approach the spiritual and sacred. In a way, it sets up your spiritual guide for failure (and you for disappointment) if he or she receives a message that runs contrary to what you were hoping for. So while you can’t keep your heart from hoping or wishing for something to happen, you should try to keep your mind open to the possibility that the universe has other plans for you. Even before I search for a physic reading near me (sic) or walk into one of the unknown palm reading places near me, I do my very best to make sure that I am open to finding the answers, whatever they end up being. No matter where I am or what’s going on, before I look for a physic reading near me (sic) or palm reading places near me, I determine the reason I need those services. Is it because I have a curiosity that needs satisfied? Am I at a fork in the road and having trouble deciding which direction to go? Do I need spiritual advice about a personal journey I am on? Am I seeking a prediction? Or validation for a current life path? The more information I have about where I am emotionally and why I want a particular service or spiritual product, the more I am able to get out of it. Setting your intentions and focusing on being open is extremely important when starting out with a new spiritual guide. It may be helpful to do a cleansing ritual or to have your chakras aligned if you are struggling with getting to the heart of an issue in your life. Taking that first step toward spiritual awakening and self enlightenment can be scary. Opening up to someone new in a brand new way is not an easy thing to do. For me, searching around a new area for a physic reading near me (sic) or stumbling upon palm reading places near me is an adventure and an opportunity for growth and change. I think once you make the decision to try it, you’ll agre. Past Life Regression: What Is It All About?